Goodreads Summary: Everybody knows Cate Cahill and her sisters are eccentric. Too pretty, too reclusive, and far too educated for their own good. But the truth is even worse: they’re witches. And if their secret is discovered by the priests of the Brotherhood, it would mean an asylum, a prison ship — or an early grave. If what her mother wrote is true, the Cahill girls aren’t safe. Not from the Brotherhood, the Sisterhood — not even from each other. Witches are one of my favorite paranormal creatures. Maybe it's because witchcraft seems more possible than something like shapeshifting, or maybe it's because of Harry Potter, but regardless, I love witches. So when I learned that Born Wicked combined witchcraft with historical fiction and a little romance, I knew that I had to read it. Cate Cahill has a good reason for keeping herself and her sisters out of society as much as possible. People might whisper that the Cahill sisters are eccentric, but Cate hopes to keep them from guessing a worse truth - that the Cahill sisters are witches. Since their mother's death, Cate has tried to keep her sisters and their magic under control as best as she could. However, once Cate finds her mother's diary, magic is all that is on her mind. Well, magic and a certain boy named Finn Belastra. As Cate begins to unravel the prophecy and secrets in her mother's diary, Cate realizes that she has to be more careful than ever, not only with her magic but also with her heart. But how long can the truth stay hidden...about anyone? Born Wicked is a book that draws you in from the beginning and keeps you turning pages because you never know what will happen next. There is no shortage of intrigue, scandal, and secrets throughout the course of the book, and I stayed up most of the night reading it. Cate is a character who is frustrating at the beginning but soon becomes someone easy to sympathize with. She's taken on the responsibility for her family and is willing to sacrifice her own happiness for the sake of her sisters. Both Maura and Tess are developed with Cate, and their interactions all felt real. In addition, I loved watching her relationship with Finn develop - there was definitely chemistry between them - and I enjoyed seeing Cate come into her own and embrace her magic. The one thing that did bother me about this book was the setting. It's set in an alternate 1890, and while I liked the idea, it never felt quite authentic to me. While some elements of the setting were definitely vivid, it was hard to be fully immersed in the world. Despite this, I enjoyed the other aspects this book. The last fifty pages were such a roller coaster, and the ending left me needing the next book already. 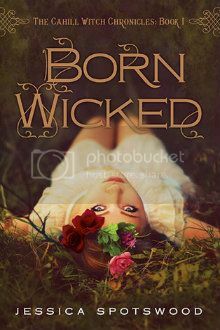 Born Wicked is a great debut novel from Jessica Spotswood, blending genres into a spellbinding story. I can't wait to see what happens next for Cate!